How it Works – Ebates is a website “Where it Pays to Shop Online”…and just as their tagline states, Ebates pays you a percentage cash back at various online retailers when you click through the Ebates website. It is FREE to join and FREE to use. And when you sign up, you receive $5 cash credit to your account, or you can choose from 1 of 3 $10 gift cards! All you have to enter is your email address to get started! How it Pays – Ebates pays on a quarterly basis. They will mail you a check (your mailing address must be updated in your account after you sign up if you want to receive your moulah!) 4 times a year. The minimum threshold to meet to receive a cash back check is just $5!!! Why you should refer friends – Ebates recently updated their refer a friend program! And you could win a cruise if you refer enough people!!! Refer 50 friends and get an iPad. Refer 100 friends and get a $1000 shopping spree. Refer 200 friends and get an iPhone/DroidX + 1 yr service or $2,500 cash. 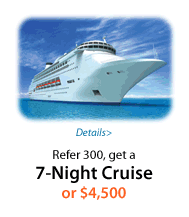 Refer 300 friends and get a cruise or $4,500. Details and rules: A qualified referral is a new user to Ebates who makes a purchase of $20 or more earning cash back. between 8/1/10 and 9/30/10 and they must make their qualifying purchase by 10/10/10. Ebates is offering 10% cash back on ALL purchases at Old Navy Online! But you must click through the Ebates site to the Old Navy site to get your cash back! Go to Ebates and sign up for an account. Search for Old Navy (it’s likely on the front page) and click on the Old Navy page. Then click on the Old Navy link and it will redirect you to the Old Navy website. Browse the sales, clearance and back to school deals to get the best prices…then get what you need. Your Ebates account will be credited with 10% cash back of your total Old Navy purchase between 2 and 30 business days later (credit back time varies by online retailer). Other hot deals right now on Ebates…15% cash back on Restaurant.com and 8% back on Lillian Vernon back to school supplies! If you are not using Ebates, now is the time to start! I booked our trip to Colorado last month, as well as 2 other trips we have happening later in the year, through Ebates! It’s a great way to get a little back on your online purchases!